Inbound means L cars going toward Embarcadero Station. Outbound means L cars going toward San Francisco Zoo. 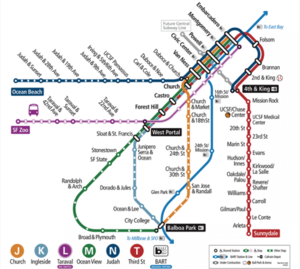 From San Francisco Zoo, L operates on surface until West Portal, then continues underground to downtown under Market Street. L-Owl bus provides overnight and early weekend morning service. This page was last edited on 3 December 2018, at 17:54.